Genuine Traxxas LED Light Kits for the TRX-4 are engineered with the same outstanding quality and attention to detail as the truck itself. Precise Traxxas fit and finish makes installation easy and fun for any skill level, and the waterproof design allows for all-weather adventure after the sun goes down. TRX-4 LED Lights are available as a complete kit or as individual components, allowing TRX-4 owners to select the exact setup that meets their needs. 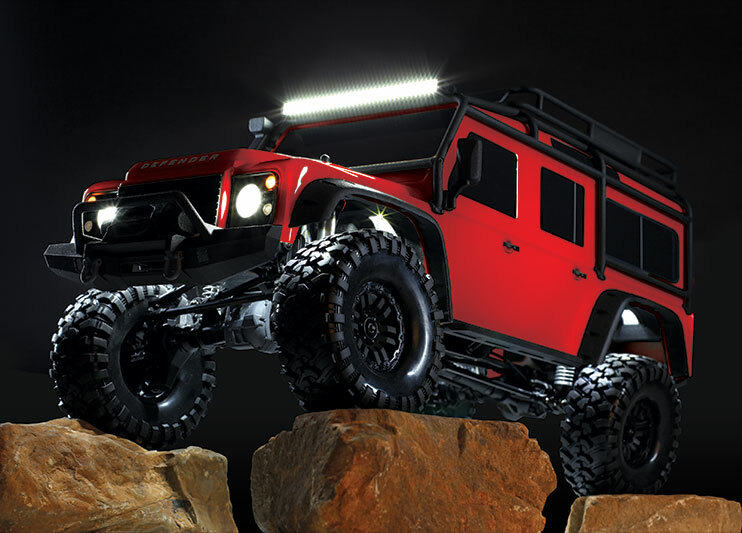 Designed to the rigorous standards of both Traxxas and leading lighting manufacturer RIGID, the LED light bar utilizes surface mount LED technology and a custom clear lens for unsurpassed realism. The integrated switch controls the brightness of both the light bar and the headlights. The light bar bolts directly to the Land Rover Defender ExoCage, but the universal mounting tabs also allow easy custom installation on a variety of surfaces. Also available in #8029 and #8025. Designed specifically for the Land Rover Defender body, the LED headlight and tail light harness is a direct replacement for the factory lens components. Fourteen total bright white LEDs bring the headlights to life, while secondary lights illuminate the amber parking lights and red tail lights for a true scale look. Also available in #8027. 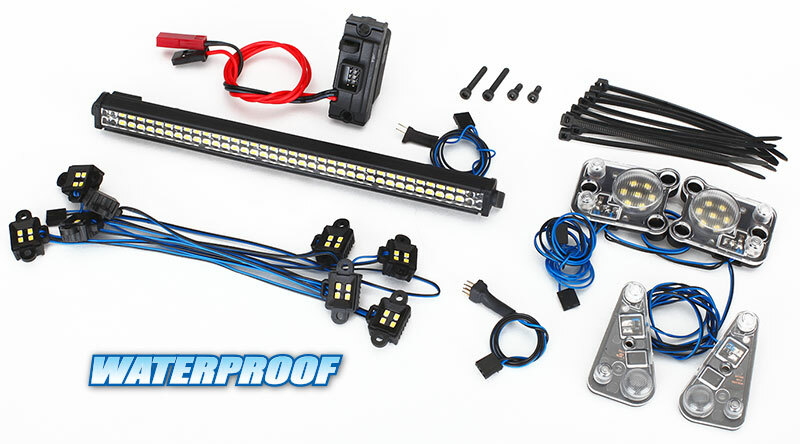 Adding LED lighting components to your TRX-4 is simple with the waterproof Traxxas power supply. This unit provides stable, regulated output with batteries ranging from NiMH to 3S LiPo. The power supply connects to the receiver and electronic speed control to provide single-point control of your lighting components, and the included 3-in-1 wire harness allows the full lighting setup to be connected with a single plug. Also available in #8029 and #8028.